Connecticut’s Democratic junior Sen. Chris Murphy secured his second term Tuesday, beating three other candidates seeking to unseat him. Murphy was declared the winner of his race by major media outlets shortly after 8 p.m.
Murphy, a Democrat also endorsed by the Working Families Party, was challenged by Republican Matthew Corey, Richard Lion of the Libertarian Party, and Green Party candidate Jeff Russell. 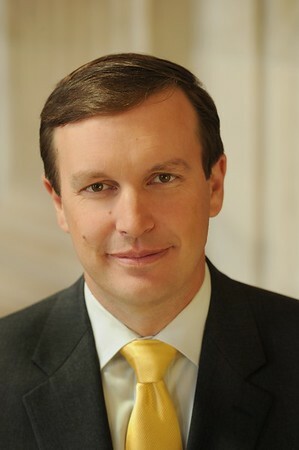 Murphy previously served the 5th Congressional District for three terms in the U.S. House of Representatives and spent eight years in the Connecticut General Assembly. Corey is a lifelong Manchester resident and U.S. Navy veteran. Corey worked for the U.S. Postal Service and then as a truck driver for Roadway Corp before he launched a high-rise window cleaning company, Advanced Services International, in 1990. There were also races Congressional races for the U.S. House of Representatives. Check back with www.NewBritainHerald.com for final results on all the state’s Congressional contests. In the U.S. House of Representatives; incumbent John Larson, D-1st District, was challenged by Republican Jennifer Nye and Green Party Candidate Tom McCormick; incumbent Joe Courtney, D-2nd District, was challenged by Republican Dan Postemski, Green Party Candidate Michelle Louise Bicking and Libertarian Daniel Reale; incumbent Rose DeLauro, D-3rd District, was challenged by Republican Angel Cadena; and incumbent Jim Himes, D-4th District, was challenged by Republican Harry Arora. Posted in New Britain Herald, General News on Tuesday, 6 November 2018 20:10. Updated: Tuesday, 6 November 2018 20:12.